With our office in Historic Downtown Kingsport, the clients of Jim Williams & Associates enjoy the kind of client-focus and personal service so often lacking at larger, more impersonal firms. A qualified attorney from our office will guide you to a resolution of your issue based on sound legal practice and a comprehensive understanding of the law. Jim Williams & Associates serves clients with dignity and respect. We believe an informed consumer will always make choices in their own best interest - which is why we offer a FREE initial consultation to all clients. Watch our recent video on rebuilding your credit after bankruptcy. In recent years, legislation has altered U.S. bankruptcy codes and changed the steps for filing and the type of bankruptcy for which you may qualify. Unlike what you may have seen represented in the media, there are a few drastic changes in the new code; rather, there are additional steps added, including mandatory credit counseling and a clarification under which type of bankruptcy an individual or business may claim. We know financial problems can create significant stress on individuals and families. This is why we diligently work with clients to achieve a timely resolution of financial problems through the bankruptcy process. Many individuals facing bankruptcy are afraid that they will not qualify, but this is simply not the case. The bankruptcy attorneys at Jim Williams and Associates will guide you through the bankruptcy process, and advise you as to the type of bankruptcy you qualify for and what best fits your financial needs. Watch our video to learn when to call a Criminal Law Attorney. 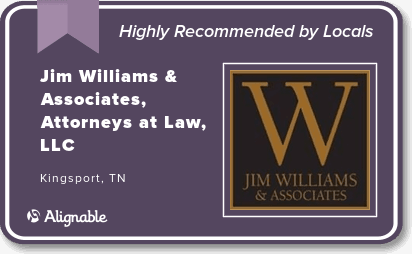 Jim Williams and Associates represent clients charged with felony and misdemeanor crimes in all state and federal courts in Tennessee and Virginia. If you or a loved one have been arrested or are being investigated for a crime, you need to immediately seek the advice of an aggressive criminal defense lawyer. Right now, you are probably filled with fear, have a million questions and are not quite sure how to proceed. Don’t panic! You should act intelligently and consult with a criminal defense attorney now. Only an experienced criminal defense attorney can evaluate your case and determine the likelihood of success at trial or, in the alternative, negotiate a favorable plea-bargain. Violating state or federal law can result in harsh punishments, such as incarceration and excessive fines. However, being charged with a criminal offense does not have to devastate your life and your family’s life. The criminal defense attorneys at Jim Williams & Associates are here to ensure that you get your life back, your peace of mind and your freedom. We employ an aggressive defense, often convincing the prosecution to reduce or dismiss the charges against you. Our sole priority is to achieve a resolution that you can live with, without significantly affecting your lifestyle or your job.